Island home - on Canal - BOOK NOW for Spring/Summer 2019! Bear with us! VRBO has once again changed the way rental rates are displayed. If you have any questions, or if things don't look right, please contact us. We try our best to respond quickly and thoroughly. For Spring and Fall 2019, FULL WEEK rentals will receive a discount on the nightly rental rate. If you select a full week in your inquiry, the rate will adjust automatically. Discount does not apply to taxes, post rental cleaning, or the security deposit. Regular off season nightly rate is $140/night - minimum 3-4 nights depending on time of year. SUMMER rentals (mid-June, July, early August) - WEEKLY rentals, Saturday to Saturday, NO exceptions. We are not a hotel. Please allow AT LEAST 5-day advance notice for a rental so there is enough time to complete paperwork, payment, etc. The ONLY payment method is credit card via VRBO. To secure a vacation reservation, you need to submit an online inquiry. From such, we will discuss pricing and contracts. No vacation is guaranteed until a signed rental agreement AND deposit payment are received – rates and availability are subject to change until your paperwork is processed. Rental agreements can be scanned/emailed our sent via mail to the owners. Long-term rentals considered during off season only (Oct-April). Inquire about availability and rates. This house not available? Check out or other home on the island (VRBO listing #178123). FOR OUR BOAT AND JET SKI OWNING GUESTS - THERE IS A BOAT RAMP ON THE MAINLAND SIDE OF THE SUNSET BRIDGE. Note that the canal is shallow - we have a 17 foot skiff that clears, but larger water craft may not. Dredging is being scheduled, but no details available yet. Dreaming of a quiet getaway to the North Carolina coast? We did a complete cosmetic renovation of this 4 bedroom / 3.5 bath house in 2008, and continue to make updates annually. This is our home away from home and we want you to enjoy Sunset Beach just like our family does. The property is a great size for a family getaway (with grandparents, cousins, or friends). The Island of Sunset Beach is also a great alternative to the mainland convention/golf villa hotels and condos. This home has a spacious open floor plan on the main level and is tastefully furnished. The kitchen is well-equipped. There are games and activities galore. Under the house you'll find lots of space to relax. Take the canoe or one of the kayaks down the canal to the Intracoastal waterway. The screened porch provides a great venue for an afternoon board game or dining al fresco. Enjoy ocean, canal, and Intracoastal views from the decks and rear windows. Sun decks on the main and upper levels provide alternative spots to the beach. I fact, the front deck was recently expanded - great for morning coffee or just relaxing. Access to the beach is less than 300 feet from the house. We welcome rentals from families and responsible adults over the age of 25. The house sleeps 8 - please check the floorplan to make sure the bedding arrangements work for your group. Absolutely NO pets or smoking in this home or on the property. 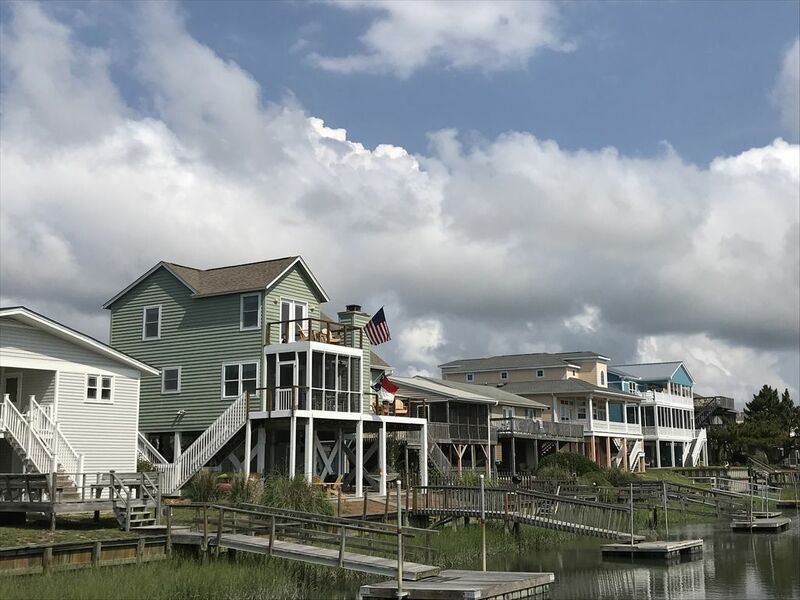 About Sunset Beach – it is the Southern-most island on the North Carolina coast and just 20 minutes from North Myrtle Beach. Sunset Beach is one of North Carolina’s most peaceful beaches with over 200 feet of natural dunes before the first row of homes. The atmosphere is quiet and family-oriented, even during peak season months. One of the Nation’s most beautiful wildlife preserves – Bird Island – is just a short walk down the beach. Observe deer, wild goats, sea turtles, and other sea life as well as enjoy miles of undeveloped dunes and marsh areas. If you're a golfer, you don't have to travel far to enjoy dozens of courses. Also, we're close to many local conference centers (Sea Trail is one), making our home a nice alternative to hotel lodging. Welcome to our Beach House! This is our second home on the island - the canal provides easy deep water access for anyone with a boat, jet ski, kayak, or canoe. It also provides an alternative venue for when the family gets tired of the beach. The house was built in 1991, and has undergone a full consmetic renovation, including new appliances, lighting, flooring, ceilings, a rebuilt fireplace, and plenty of furniture upgrades. We continue to make updates - more recently expanding the front deck, replacing exterior doors, updating bathroom lighting, and more. The home is open and airy - fantastic views inside and out - we love it and hope you do too! o Sunset Beach is synonymous with family - what a fantastic place to vacation! o Bring your boat or jet skis as the canal provides deep water access to the Intercoastal. o Extensive dunes and broad, flat beach make for great walks and biking. o Explore the marsh as an alternative to a day at the beach. o More 'commercial' activities are a short drive onto the mainland - mini golf, regular golf, dining, movies, etc. Under the house in back near the canal or on the new front deck are our two favorite outside hang out areas after a long day at the beach. We love Sunset Beach and know you will too. shower, Large outdoor shower w/hot water under the house. 6 houses back from the front row and beach access - about 300 feet. Gorgeous and peaceful ocean and intercoastal waterway views from sun decks, screened porch, and many interior rooms. Bring your boat or Jet Skis! We're on Canal A and have a boat dock. Access to the intercostal waterway via Tubbs Inlet. Dual systems - one for main floor and another for upper floor. New units installed recently. New washer is located off the kitchen inside the home. New dryer is located off the kitchen inside the home. WIFI is offered May-Oct only. If you need WIFI during non peak season, arrangements can be made for an additional fee. Side by side fridge with ice maker and water dispenser. Single oven....large enough for multiple dishes at once. Both traditional drip coffee maker and Keurig are available. Stainless Steel appliances - kitchen is well equipped for cooking even a Thanksgiving Dinner! Table seats 6 comfortably; extra seating at a side table, kitchen counter/bar area, screened porch (table/chairs), and under the house. Smart TV w. DVD player in great room. Use your own Netflix account to watch shows or movies. All TVs are cable ready. Expanded cable available May-Oct ONLY. Blue tooth radio so you can stream music from your personal device. Available with all the TVs. We have a large beach library - take one, read one, leave one! A game closet full of entertainment is available for guests of all ages. Thomas the Train set in the family room toy bench - a great distraction for the little ones. Many DVDs are on property - the collection has quite a mix - certainly something for everyone! Upper level sun deck with Adirondack chairs and open cable railing system provides great views of the canal, Intracoastal, and OCEAN. Both a canoe and two (2) single person kayaks are available for guest use. Life vests and paddles also provided. Chairs/hammock under house - extended decking makes for great entertaining space. Screened porch and sun decks nicely furnished -12 new wooden Adirondack chairs adorn all three levels. House is on stilts (as are most homes on the island). There is no elevator and both access staircases are steep. Please keep this in mind as the house may not be suitable for those with mobility concerns or for very young children. The house sits on Canal A, which has deep water access to the Intracoastal waterway. Day trips to explore the marsh, boat to dinner, or Jet Skiing are great activities to add to your beach vacation. If you have a boat or jet skis, please inquire about access to the dock. No land line phone is available at the house. Guests are expected to provide their own mobile phone(s) for communications. Great Spring Break at the Bugg House!!! What a great find! We stayed at the Bugg House during Spring break with my teens and mother and truly enjoyed our 5 nights. The house was very cozy. Lots of space for everyone. I enjoyed the various decks available. Great view of the canal too. Kids enjoyed the kayaks, hammock and the short walk to the beach!! Jeanette was very accommodating and responded quickly to my questions and concerns. I will certainly come back! Thank you for sharing your home with us. Very nice house, great location, owners wonderful to deal with. Me and my husband spent our 30th Wedding anniversary there and had a wonderful time. The house was great and having the dock to fish off was wonderful, we were hoping to take the kayaks out but weather was too cold. Would definitely recommend staying here. Thank you for selecting our home at Sunset for such a special beach celebration of your 30th wedding anniversary. The one thing we cannot control is the weather. We do hope the alternatives like sitting out on the new front sun deck or enjoying one of the many board games or movies provided alternative activities for you and the family. Please do stay with us again! We loved the Bugg house! Even in the winter the decks were great to sit out on and watch the birds fish in the canal and listen to the sounds of the ocean. We even took the Kayaks out with the added benefit of being one of the only families out on the water :) The house was clean and comfortable and we enjoyed having access to the games in the cupboard. Overall a great stay! Beautiful home, well supplied, close to everything we needed. Hello and a belated thank you for selecting our home for your Fall beach getaway. Fall is my favorite time at the beach (as long as there is not a major storm!) We've recently finished the updates to the expanded front deck, adding a new outdoor table and bench. We've also painted inside - it's all just a bit 'fresher' … do consider another trip to Sunset and a stay at the Bugg House! Most of our guests are repeat renters. House is comfortable, lots of beach related equipment, such as kayaks that made our stay fun. Fabulous beach is right! Sunset Beach is the hidden gem of the Carolinas. Glad you had a fun stay. The kayaks and the canoe - and just being along the canal - provide great alternative activities from the beach. Please visit again soon. Spring 2019, we have finished the deck expansion project (painting and staining) and updated a few items inside. We're always trying to keep the place fresh for our guests. Beautiful house with a beautiful view. Having the canal at the back of the house was amazing. I have been to Sunset Beach, North Carolina each year to visit family in the area but we have always stayed with family. Now having children, we decided to rent a beach home and we are so thrilled that we made that choice. The Bugg House is spacious, clean, and honestly, child-proof. The stairs were easy to navigate for my 17 month old and my 3 year old. The children were always in our view but there was never a time that we felt that they could be in danger. The house has plenty of rooms, bathrooms, porches, and amenities. We were comfortable at all times at the house. Having the back of the house on the canal was an amazing experience for my family. We fished and caught crabs daily. We saw plenty of wildlife from birds to jellyfish from the dock. My children were thrilled to see all of the wildlife. We also enjoyed the board games and the books that were supplied by the family. It made for nice evenings/nights that were spent with the family in relaxation. The owners were always available and within a phone call away. Checking in and out was very easy. Sunset Beach is the nicest beach that I have been to and I have been to quite a few beaches. The beach is even nicer when it is a short walk to the beach when you have a semi-private walkway from 6th Street (the entrance to the beach near the Bugg House). It is a 3 minute walk to the beach with children on a wooden walk way through the dunes which are packed with wildlife and plant life. Once you get to the beach, it is essentially a "choose wherever you would like to sit" beach because the 6th Street walkway is so private. The beach is amazing. All in all, this was my favorite vacation because it was my children's first vacation in a place that I love. The Bugg House met every one of our expectations and then surpassed them. It was such an enjoyable time at the house especially the down time when the children were napping. There were so many places to cozy up and read a book in the Bugg House or just sit back and relax. We plan on coming back next year and would love to stay in the same exact house because it was so welcoming. Thank you for your thoughtful and detailed review. It's feedback like this that help our future guests best evaluate if our property is the right one for their vacation. We purchased the house when our kiddos were young. We've intentionally stocked the house with lots of activity items as we know that just hanging out on the beach can get old...being on the canal provides great alternative venues and we have an overstock of games, movies, and books. You enjoyed the newly expanded front sun deck. Know that we've now painted and finished the deck project, even adding a great center table for casual meals or just hanging out. Please do stay with us again! Most of our guests are repeat visitors. Rates subject to change until reservation is confirmed. No reservation is final until signed rental agreement AND rental deposit are received. Taxes are in addition to the quoted rental rates. Please contact the owners with any questions - we try to make the process as simple as possible.